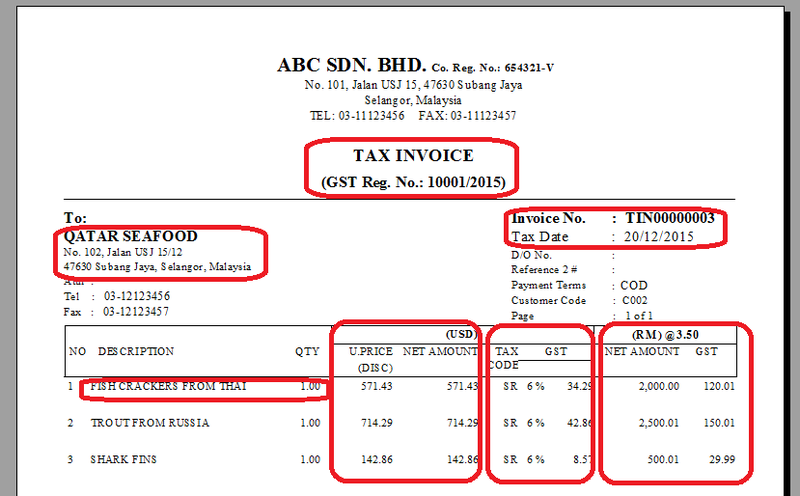 Note: Malaysian Government will be implementing GST by April 2015. All Malaysian registered business is required to implement them. Implementing GST without a system can be challenging as the government requires a lot of documentation to be supported. Please find below summaries of GST requirements, the background, the impact and how SkyBiz is handling these requirements. The list is not exhaustive and will continue to be enhanced as more features are made available to our users and changes continue to be made in consultation with the Royal Malaysian Customs. 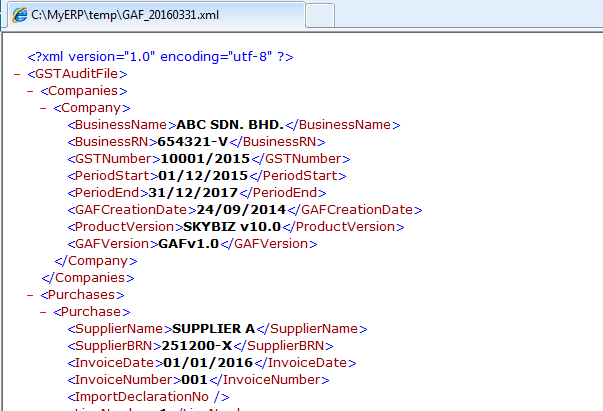 Here user has to update their respective GST registration number and GST date. The Tax Invoice issued contains the proper details of the customer and this is important from the business perspective as the customer may need to claim his or her tax on the invoice and therefore requires that all details are complete. •	All Tax Invoices require the proper and complete information. •	If you do not follow the proper requirements thence you are not issuing a proper Tax Invoice under the provided guidelines and therefore under Section 33, 34 a taxable person will be committing an offence. »In the maintenance of customer information in our product we have added more fields to meet this requirement. You can enter all the relevant details including the GST number of your customers or supplier into the master data and it will be kept for usage during the printing of the necessary documents such as invoices. RMC Approval No. 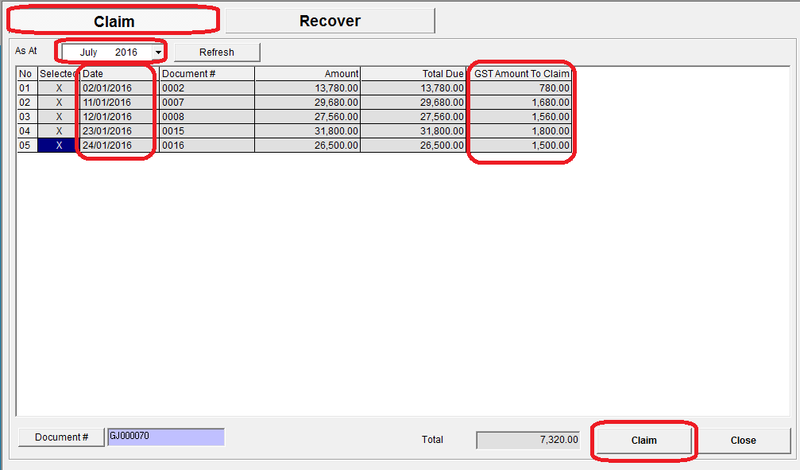 and date fields are also made available in Supplier maintenance for handling Self-Billed Invoices, if it is required. The start of the taxable period is determined by beginning of the month when the taxable person has breached the threshold of RM 500,000 for mandatory GST registration. •	This is the proper determinant on when tax returns are due. 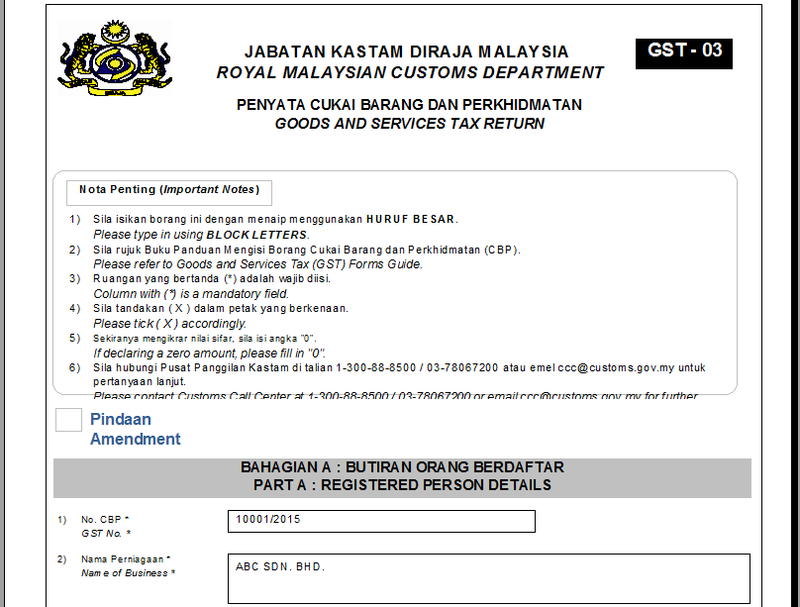 Based on the requirements from the Royal Malaysian Customs, (RMC) there are a set of GST Codes and the corresponding properties, i.e. rate of tax which is prescribed available for reference and use. •	These codes are standardized and are allocated for different types of transactions such as standard rated, zero rated items. •	Handles inclusive and exclusive conditions. •	There are various conditions for the different utilization of the tax codes. To be able to select the correct or proper tax code, a user will need to have the fundamental GST knowledge to apply the correct code. >>>SkyBiz pre-loads all the necessary GST codes from RMC into our software and if you choose a standard company set-up, the default codes are already in place. The more important issue is that history has shown us that over time, the tax codes can be modified, or new tax codes introduced as laws continue to mature and get fine-tuned by policy making and changes. For SkyBiz customers, this is never a concern as our online update process will update all your tax codes to the correct properties as and when required. We think very much ahead so that you do not have to worry about it. Just keep your product updated via our maintenance programs and you will keep your peace of mind. 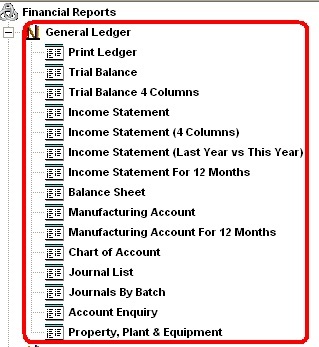 Allow user to setup tax schedule and maintain tax code. 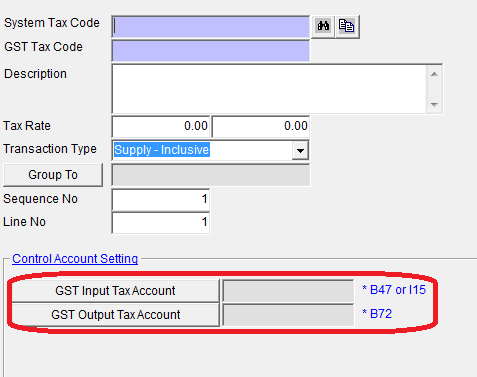 Fill up System Tax Code, GST Tax Code, Description, Tax Rate, Transaction Type, Date Created. 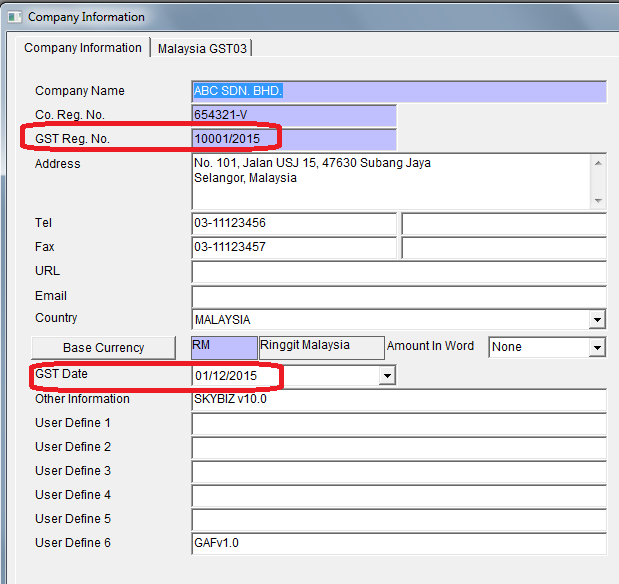 Date Commerce & Date Expiry.According to Malaysian Government, the GST rate will change over time. We have ensured that transaction entered picks the right GST rate for the respective period. Our tax rate supports simple to complex definition. From simple one item tax to tax addition and up to compounding tax computation. System Tax Code System Tax code to be created. GST Tax Code Custom GSTTax code to be created. Description Explanation on the GST Tax Code. Tax Rate Specify the tax rate. 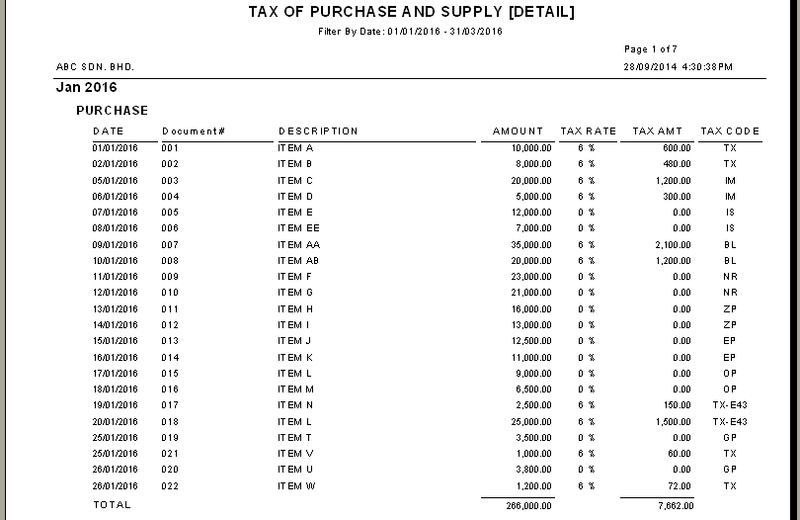 Transaction Type Purchase or Supply Tax Code. 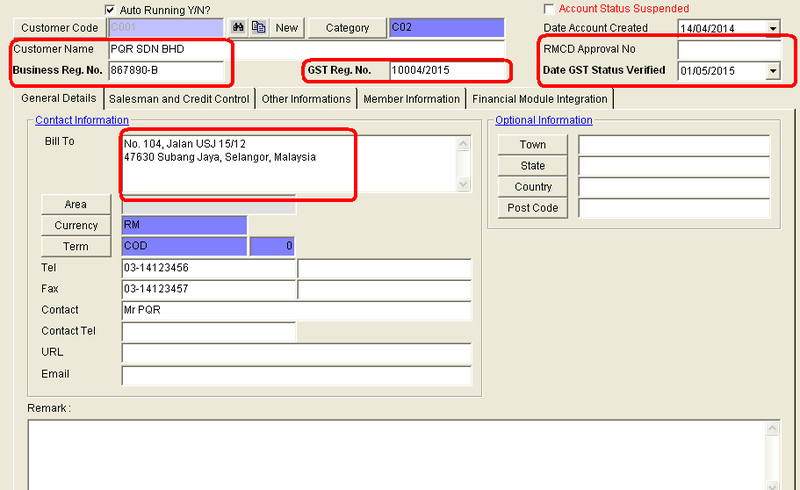 Our system has the function to show the tax code audit log in order to ease the job during GST report auditing. 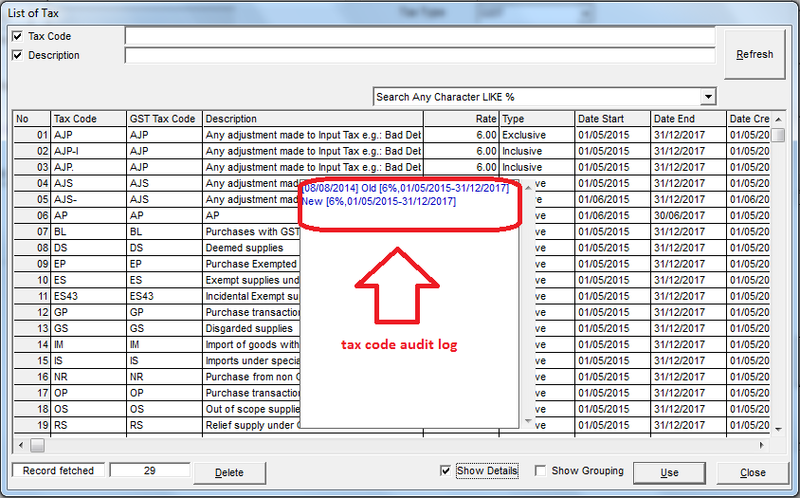 User can select the tax code to delete or modify. >>> Here user allows to preset all related GST tax account default double entries posting accounts. The Tax Invoice is an important document that contains details on the supply that has been made. It triggers the time of supply, basically determines when the tax is payable by you. It is the document or evidence to the supply, important for your customer to claim input tax if they are not an end consumer. Contains information on the supply, tax applied and the necessary amounts and details. MUST have an original, others will be duplicate copies. MUST be issued electronically or printed form. MUST be voided/canceled via the issuance of a Debit or Credit Note if information is wrong or incorrect. MUST have a number of minimum prescribed information. MUST have a serialized number. Without proper invoice control, you are exposing yourself to unnecessary risk. 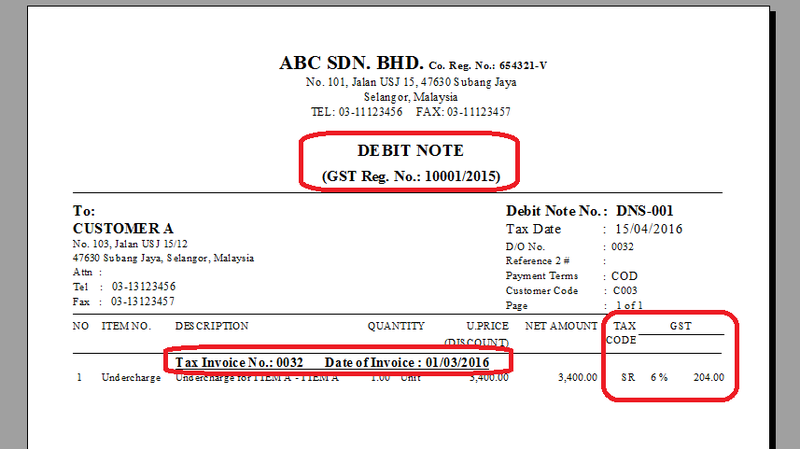 What if an unauthorized invoice from your business ends up in a GST claim from another company, and the invoice is fraudulent? You become responsible too unless you have electronic evidence and a copy. Without proper documentation and control, you will not be able to manage your transactions and invoices efficiently. How many times have you been searching high and low for an invoice? Without the proper documentation you are again susceptible to not meeting the documentation requirements and will expose you to potential fines. Any registered person who fails to issue a tax invoice or does not contain the prescribed particulars, commits an offence. » All of SkyBiz products are packaged not only with accounting but also with the Billing or Invoicing module. This is to ensure that all our customers automatically have the option to generate proper tax invoices and have the ease to be compliant to GST. A Debit or Credit Note is issued against a Tax Invoice to adjust for any discrepancies or change in supply. Triggers the time of supply, basically determines when the adjustment of tax is payable by or refundable to you. Document or evidence to the change in supply, important for all parties to adjust their tax liability. MUST be made against an original Tax Invoice which must be referenced. MUST have a number of minimum prescribed information..
MUST have a reason described for the adjustment. Without proper invoice control, you are exposing yourself to unnecessary risk. 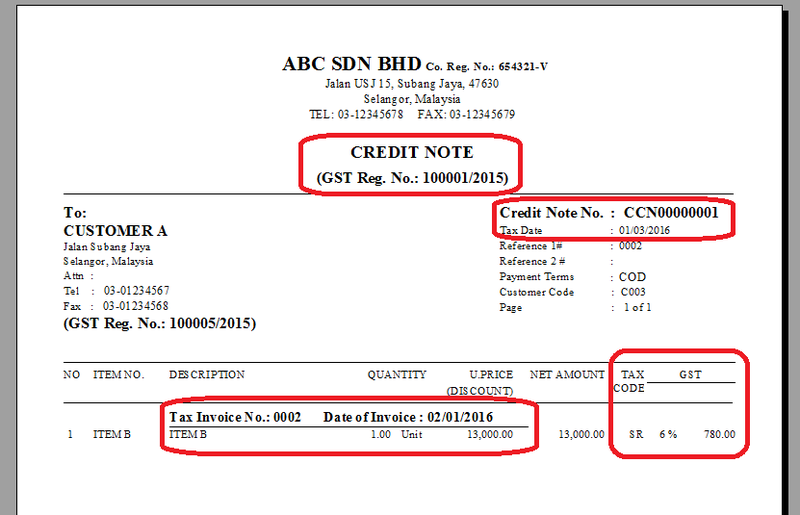 What if an unauthorized credit or debit from your business ends up in a GST claim from another company, and the invoice is fraudulent? You become responsible too unless you have electronic evidence and a copy. Without proper documentation and control, you will not be able to manage your transactions and debit/credit notes efficiently. How many times have you been searching high and low for an invoice? Without the proper documentation you are again susceptible to not meeting the documentation requirements and will expose you to potential fines. You will require these credit/debit notes to tie back to your financial accounting entries and thereafter the returns. It already sounds cumbersome if it is not managed in a proper process and invoices handled properly. Any registered person who contravenes the requirements commits an offence. A self-billed invoice is issued in the following circumstances. The value of the supply is not known by the supplier at the time of supply. The supplier and recipient are both registered persons. The supplier and recipient both agree to a self-billed invoice. The supplier and recipient agree that the supplier will not issue an invoice in respect to the said supply. Additional condition is that RMCD approval is required, and RMCD approval number must be listed on the self-billed invoice. 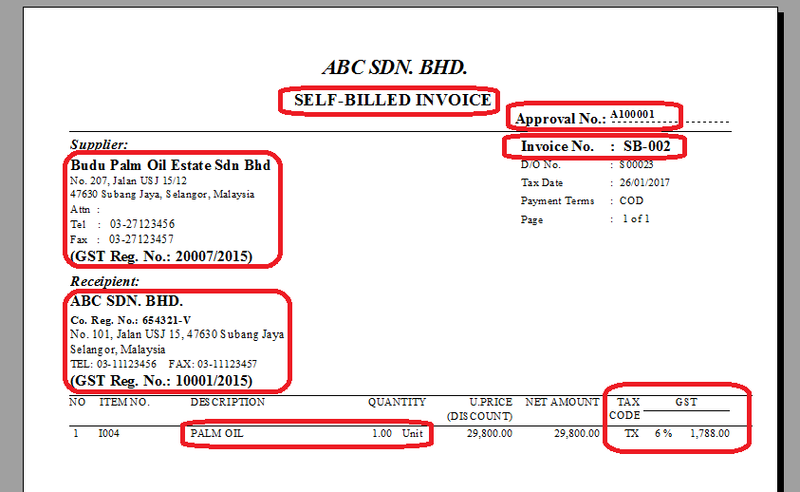 » SkyBiz provides a new feature to execute the self-billed invoice requirement. Tax returns are to be made in the proper taxable period with the form GST-03. This is the proper and official method to file the GST tax return. In the correct taxable period. 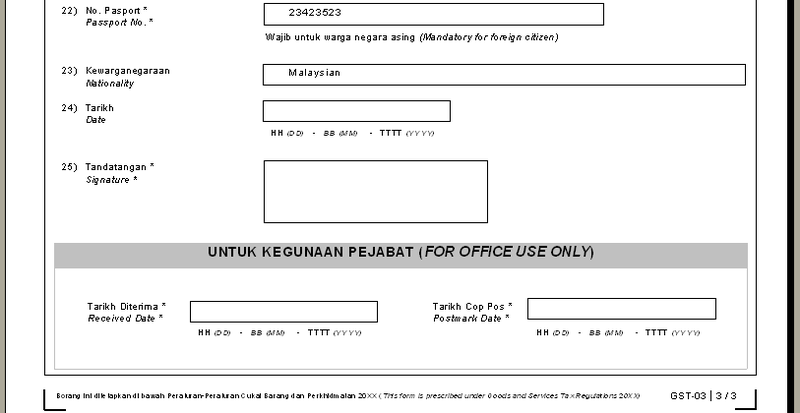 In the format prescribed, GST-03. Any person who contravenes this section commits an offence and shall be on conviction liable to a fine not exceeding RM 50,000 or imprisonment for a term not exceeding three years or both. Upon clicking the GST03 button, the filling information will be displayed in GST03 Form and you can print out these forms for submission to the Kastam. 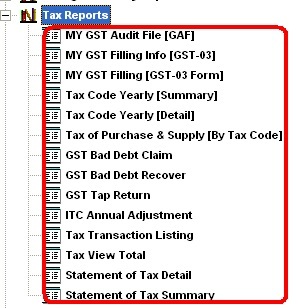 User has the option to print the tax code listing report in summary and details for auditing purpose. A software requirement that details all changes made in your accounting system to transactions. We can view the need of an audit trail from 2 different angles. If I were the owner or end responsible for a business, and all transactions are recorded through my accounting software, I would clearly want a detailed audit trail to ensure that I am aware of what is happening with my business transactions. This is especially so when there are changes, additions or omissions of transactions that I may not know about. In a business it is not practically possible to do everything, however from a security perspective it is better to know something else does keep track of it for me. For the authorities, it is clarity and transparency in the dealings of your business and the audit trail as the name suggests provide a clear trail to verify your transactions. 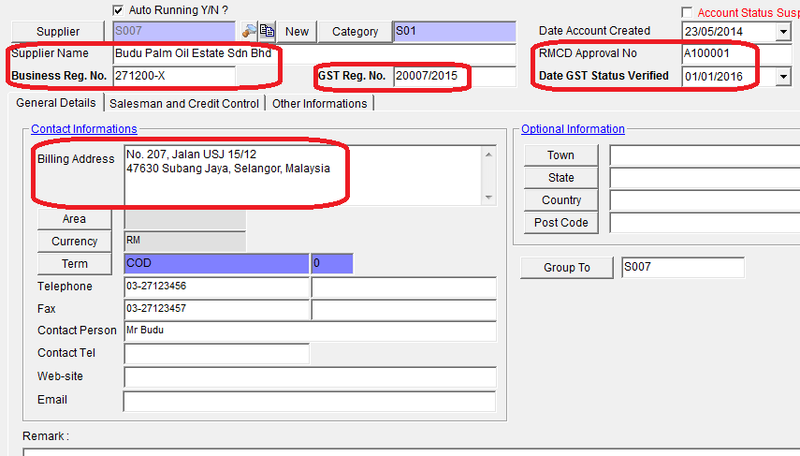 It is a condition from the Royal Malaysian Customs for accounting software that finalized transactions (posted) cannot be edited in any form and any information to be changed as this can lead to fraudulent activities. These attempts will also be captured in the audit trail. 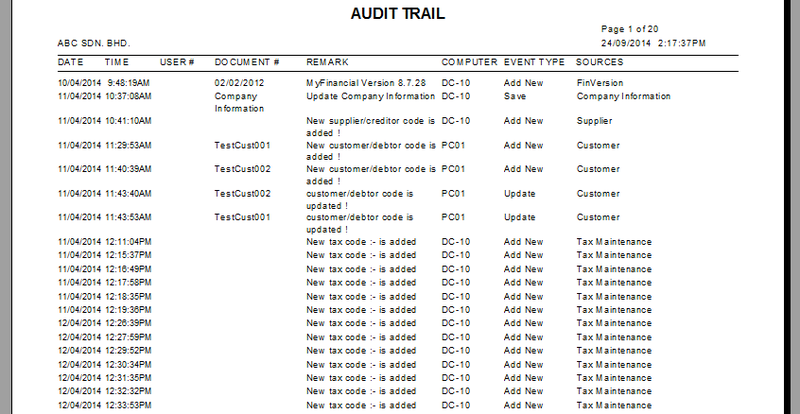 The audit trail is available directly on request from the system. 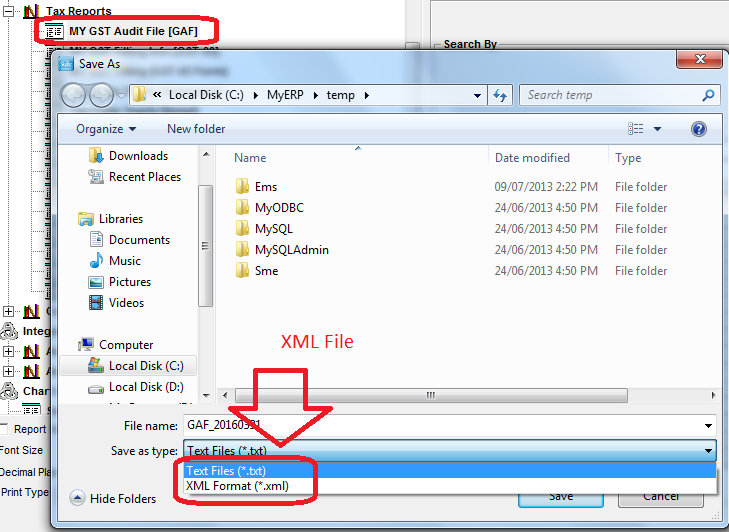 The GAF Audit File is a file that is produced from the accounting software. The GAF file is a file which tracks all of the transactions in an electronic accounting system. The GAF file automatically records all relevant information and in the detail that is required by the authorities. This file resides in the accounting system and can be produced as and when necessary. The content of this file can be used to tally against your tax return submissions. As and when requested by the authorities. A supply has been made and a Tax Invoice has been issued. However, there has been no payment or only partial collection for the debt and it is past a period of 6 months from the date of the invoice. This requirement provides relief to the taxable person where the output tax has already been paid and due to collection issues, the taxable person is unable to collect the amount as provided by the Tax Invoice. 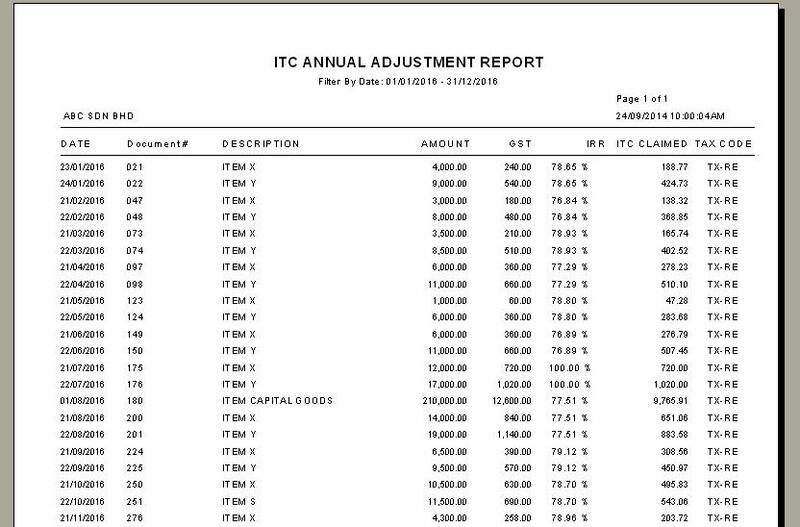 This is good as it can release stuck cash-flow as GST paid can be claimed back. However, it is also required that if collections are made that the repayment of GST is required. » This requirement is handled automatically in SkyBiz. We ensure the systems tracks the debts that are overdue more than 6 months. In the dashboard this is depicted clearly. Once the business has met the conditions as set out by the GST Act, all they need to do is to select the relevant debt and click Generate Double Entry and the correct accounting entries are generated to claim back the uncollected GST amount. 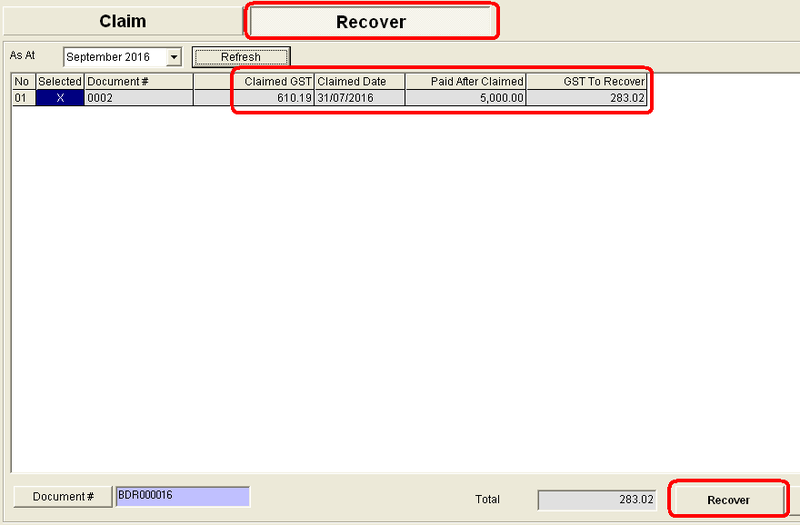 The accounting system will also ensure that the relief amount is correctly stated in the GST-03 return. 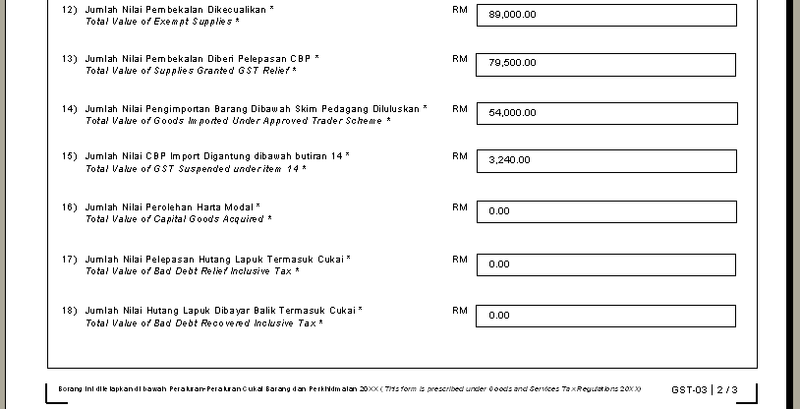 This section refers to the situation where services are imported into Malaysia. 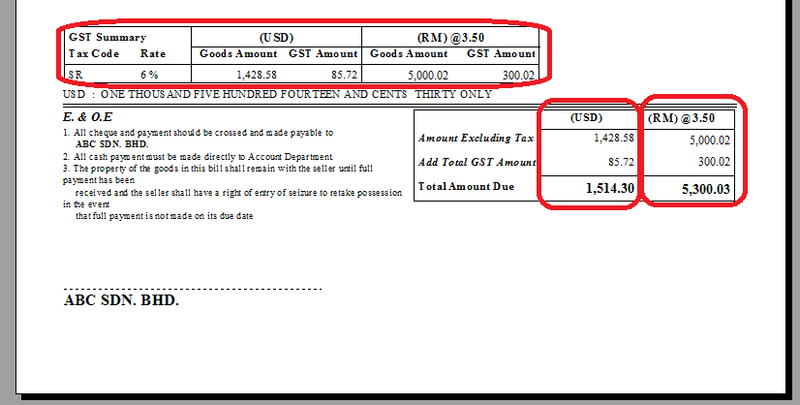 Tax shall be applicable on this supply, however since the supplier is not in Malaysia it is not expected that he/she can charge the recipient for the tax. Therefore a method called the reverse charge mechanism creates a transaction whereby the recipient charges the output tax and then claims the input tax. » SkyBiz handles this requirement by enabling the ability to allow user pre-defined imported services items. 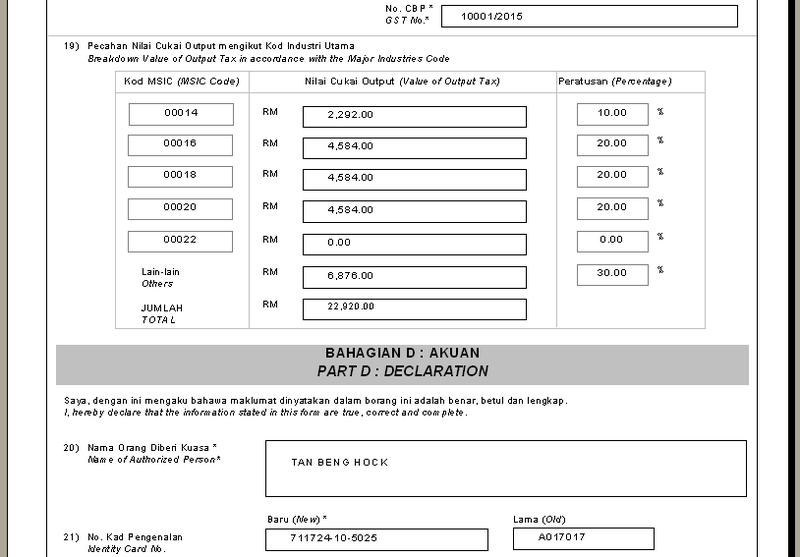 Eventually, system will auto mark the incoming Supplier Invoice as Imported Services. Upon settlement/payment, the proper treatment of GST is executed. Under time of supply rules. non-refundable deposit will be taxable even before invoice is issued within 21 days. 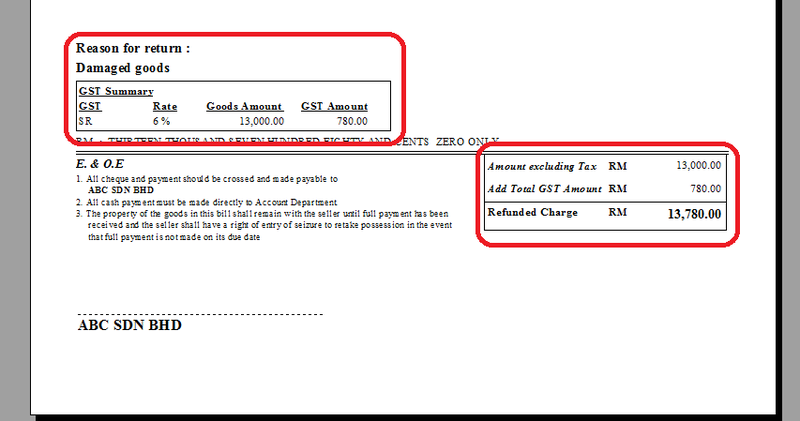 It would be consider a form of GST prepayment before billing. SkyBiz Accounting will clearly distinguish non-refundable deposit vs refundable deposit by clicking the checkbox during issuing Sales Order. The logic of behind using Sales Order is because a non-refundable deposit should be clearly documented with stock or service items define and also terms and conditions clearly stated. 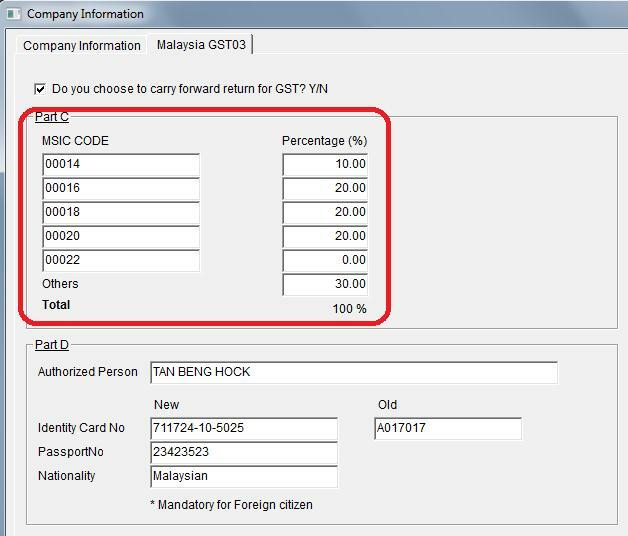 SkyBiz Accounting will first automatically generate a GST tax based on Sales Order deposit if there are no within 21 days. 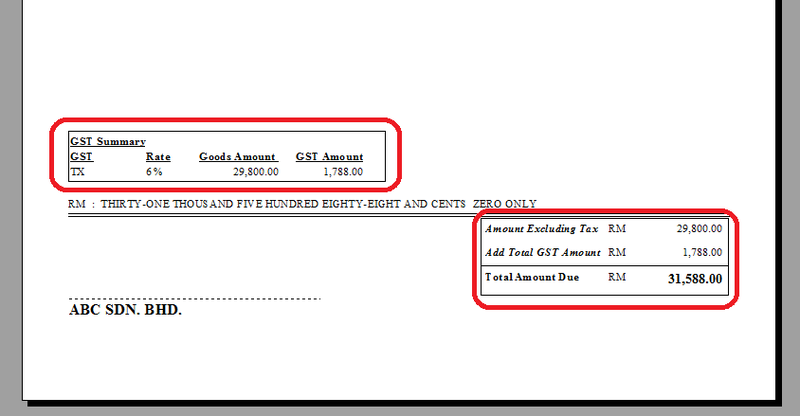 When the 3 GST tax from 1 Sales Order and 2 Invoices are added together it will be same as the exact whole GST tax value of the original Sales Order. Goods delivered to customer and non-refundable deposits from customer become taxable income in 21 days even if invoice is not issued. 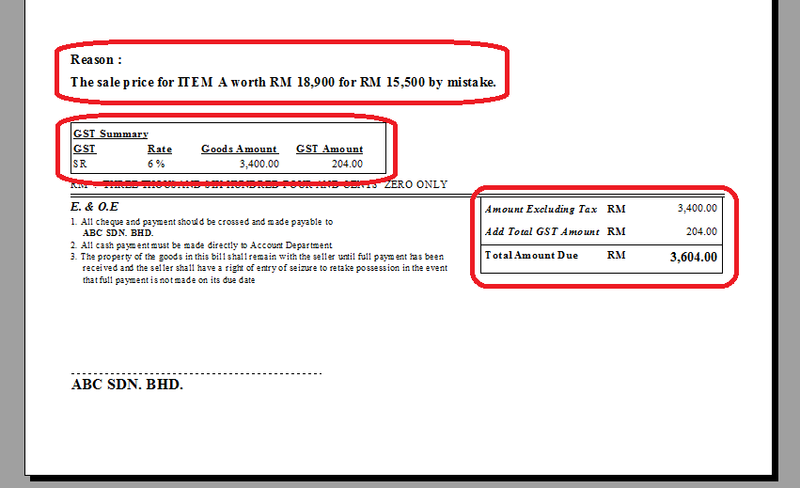 SkyBiz Accounting with confirmation from KASTAM MALAYSIA. Option : SkyBiz Accounting generate Delivery Order listing to be converted to invoice automatically. (b) An amount equal to 5% of the total value of all taxable and exempt supplies made in that period. 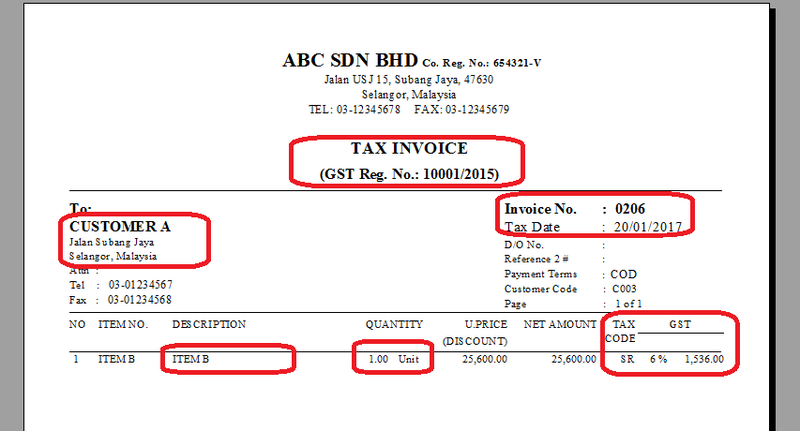 Example 1: A GST registered garment manufacturer makes taxable supplies worth RM150,000 for a taxable period. It also provides bus transportation services to its workers and charges a minimal fee. 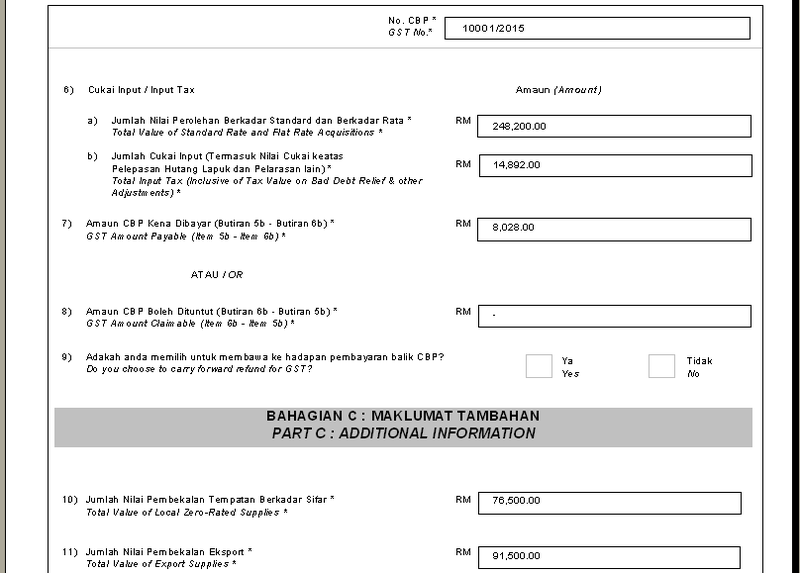 The value of exempt supplies is RM4,000. 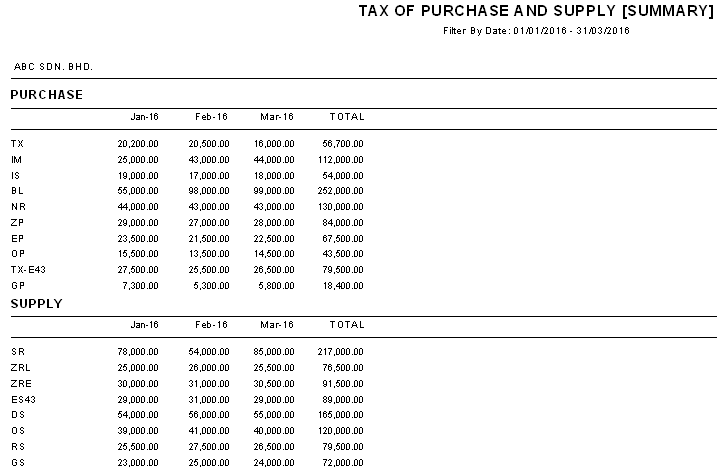 (ii) The garment manufacturer is entitled to claim input tax since the value of exempt supplies is less than RM5,000 per month and does not exceed 5% of the total value of all supplies. This part of the Act clearly states a comprehensive list of requirements (documents) to keep and make available (if required) relating to GST transactions by the taxable person. Required to substantiate all input and output tax claims. 7 years of past record. » SkyBiz products are being adjusted in structure to handle this requirement as much as possible. .
Electronic documentation is being enabled in our products to handle the following 2 scenarios. All source documents (tax invoices) created by a SkyBiz accounting software will be stored electronically in the database for safekeeping, therefore ensuring that you have a copy of everything generated from your business. Creating a facility for you to upload and keep source documents that are received by you for example supplier invoices etc. SkyBiz backup system allows user to schedule their daily backup with specific time assigned. Businesses can incur GST while acquiring such goods and service but no credit is avaialble in respect of the tax, hence the GST incurred becomes an expense to the business. to avoid the administrative burden of controlling the actual use of such goods and services, which may be easily used for dual business/private purpose due to their nature. because such commodities are supposed to contain an element of consumption in the real life sense of term, e.g. entertainment in a restaurant. It is important to note that entertainment of employees or existing customers is not blocked (but you must posses a valid tax invoice to claim). However, entertainment incurred for potential customers, suppliers, business partners are blocked from claiming the credit. Life insurance premiums are not blocked for an obvious reason. As life insurance is an exempt supply, the provider will not charge GST and thus there is no ground for the payer to claim any credit in respect of that. Medical expenses incurred by your staff. Excluding those covered under the provision of the employee's Social Security Act 1969. 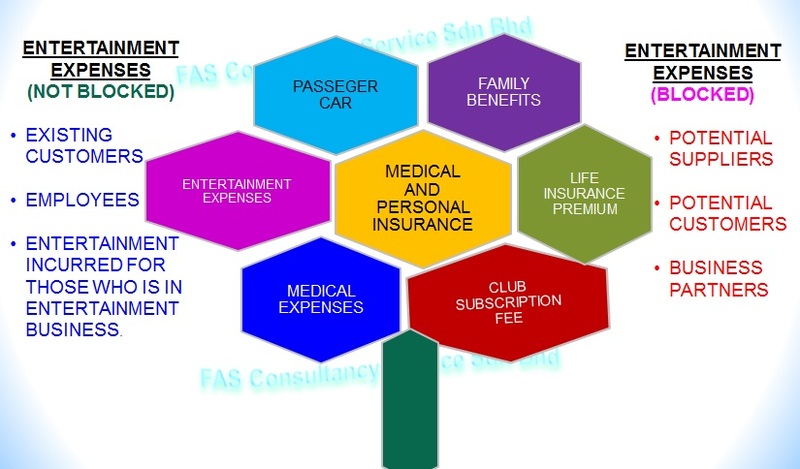 Entertainment expenses to a person other than employee and existing customer except entertainment expenses incurred by a person who is in the business of providing entertainment.